So long as you have more 6+ months of experience, CalArk will look at your application. We are a 100% automatic fleet, no-touch freight and I would say 60%+ drop and hook. If you have less than a year of experience, they'll have you go with a trainer for 40 hours. It's more assessing your abilities and brushing up on anything you may be iffy on. Depending on where you live, you have the option to go home once per week for a reset. We run primarily Midwest lanes, some Northeast, some Southeast, and a tiny bit of the LA area. But I've only been to California twice in 8 months. I've heard that there are a few Northwest runs, but I've never seen one. All our trucks are governed at 70 with the exception of the lightweight Prostars. Those are governed at 75 with and extra .02 cpm bonus. Hey Great! This is awesome to hear! Keep me posted for sure and hopefully I'll see you in Little Rock soon! I like how this thread has turned into sales pitches for the companies people are currently driving for. That's encouraging, and I sincerely mean that. Check out my company, Millis. You will have no problem getting an automatic KW, T680. We are 100% no touch, dry van freight and getting home every 2-3 weeks will not be a problem with our home time gaurantee. You get 1.5 days home for every week out. If they are late getting you home, you earn an extra 5 CPM until you are home, but you will very likely never be late getting home if you request your time off properly. Personally, I've driven both and I think it's a lot easier to learn to shift a manual after you've become more comfortable with all the other things you have to learn during training. Transmissions seem to be pretty subjective though. I know I've driven some that I love and that other drivers hate. Well I have conquered shifting now been to California and back from Tennessee 3 times since I started training I find my biggest problem is that I hurt my knee pretty badly in high school and after a day of driving my knee is killing me. I am glad I learned how to do it but I personally prefer an automatic. Okay so to get started I have about a year of driving experience a little short of that maybe. I played football all in highschool and messed up my knee pretty badly I can and have driven a 10 speed that's not the issue its that at the end of the day m knee is killing me especially if I get caught in traffic. Also my company is driver unload so that doesn't help at all. My question is are there any companies where I could be guaranteed an automatic truck that would have me home every 2 to 3 weeks and be no touch freight. I have talked to a few companies and the few I have talked to wont say they can guarantee me one except for us xpress. I have my tanker endorsement as well any help would be appreciated. From what I have found not many do hair test I smoked a few times though about three months ago and am looking at changing jobs. I didn't smoke on the job I had an injury and found it to be the only thing that helped ease the pain but I wont apply for a job that requires a hair test for at least another 3 months just to make sure. I hear a positive test makes it almost impossible to get hired any where good luck on finding a driving job. 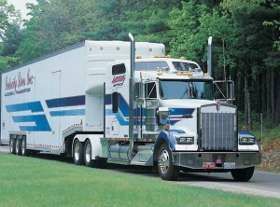 I started driving a truck maybe year ago or so and signed with a company to train me. When I started they ran only automatics I was trained on an automatic tested on an automatic but somehow got through the cracks and got a cdl without the automatic only restriction. Now the company I trained with turned into a nightmare real quick when I finished training they didn't have a truck ready for me to drive. So I decided to move onto another company only problem I had never driven a ten speed. That limited my options out of the gate. I found a job driving team with my father in an automatic so I thought I lucked out if we got moved to a 10 speed he could train me not big deal except for I had a family emergency 6 months into driving. My mother had a massive stroke and need around the clock care so I left the job and came home to take care of her now it's been six months she passed away 2 months ago and now I'm ready to go back over the road only problem no experience in a 10 speed. I have luckily found a company who will train me in a 10 speed. I wish I had started out in one to begin with I'm on my second week on it so far I haven't tore anything up on the truck so I'm counting that as a win lol. I seem to be doing really well with other than a few miscues on the first day no big mistakes on shifting or anything but I tell you as someone who trained on an automatic they should make every driver on the road drive a 10 speed starting out it makes life so much easier knowing thay if things don't work out here that I can move onto any company and not have to start all over again. I k ow this is a long winded story but thought any new drivers out there might want my 2 cents on starting on an automatic.